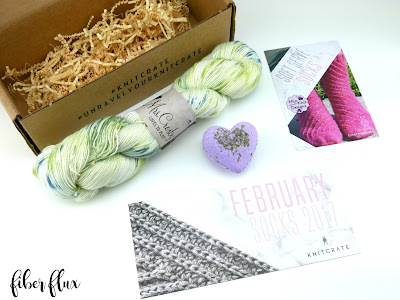 Fiber Flux: February KnitCrate...Unboxing, Giveaway and Review! 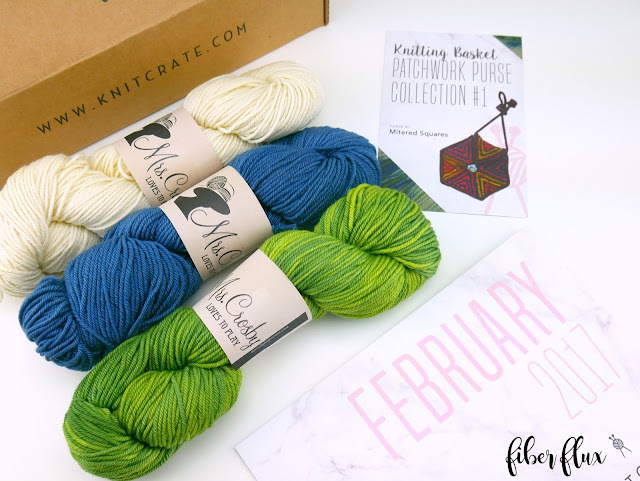 February KnitCrate...Unboxing, Giveaway and Review! Hi there stitchers! I have something special for you today! I recently partnered up with the folks at KnitCrate, the perfect treat for any yarn lover. KnitCrate is a monthly subscription box that arrives right to your door. Each month it includes a fun pattern, enough luxury/premium yarn to make the pattern at least once, PLUS a fun bonus item too! This can be a fun tool, a sweet treat, or a soothing luxury item to pamper. 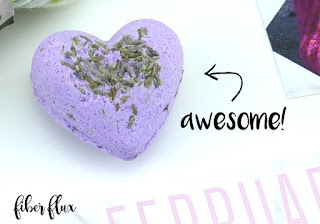 Here's February's bonus below, a lovely lavender bath treat! They're also giving away a KnitCrate to a lucky Fiber Flux reader too! Awesome!! One winner will receive one KnitCrate. No purchase necessary to enter. Void where prohibited. Open worldwide to entrants 18 and over. Enter to win using the Rafflecopter below (sometimes it takes a moment to load) Now go, go, go, and enter! Love the giveaway good luck everyone. They knit sock yarn looks lovely. Thanks Jennifer. I want to test the knit crate......but my husband would hang me....lol..just don't crochet fast enough. Beautiful yarn - thanks for the chance to win. Oh it's such a cool giveaway !! Thank you so much !! Looks like fun! Nice to get a "present" each month. Would love to win! I like the colors in this kit! Would love to win one of those "unboxings". Lovely, lovely yarn! The bags look very fun to make! Thanks for opportunity. Thank you for the chance to win the February Knitcrate. Oh boy, this looks fabulous. Off to investigate their site. Thanks for a great giveaway too! This would be the best monthly box deal ever! Yarn delivered to my door every month? I'm in! Thanks! what a neat concept. the yarn looks really neat. wonder if they will do a crochetcrate? I would love to win a Knitcrate box. This is a nice prize pack. This looks amazing....what a fantastic concept. Thank you for the chance to win. Appreciate such a nice prize. Thanks for the information about KnitCrate. 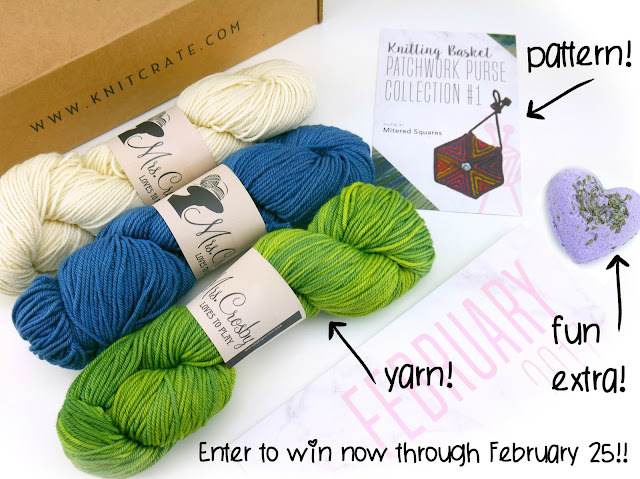 I'd love to win the February Knitcrate. So sorry about your thumb! Thanks for the giveaway! I might as well face it I'm addicted to yarn. Good luck everyone. I really like this type of concept because there is always something for everybody to love. Great giveaway, KnitCrate! Thank you!